One of Stephen Gaynor School’s unique strengths is providing an individualized educational experience within a traditional school atmosphere. Our faculty includes a range of experts in a variety of specialties who can work with children individually or in small groups during the school day as part of a holistic educational experience. 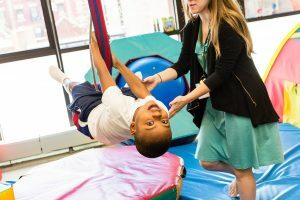 Students have access to a range of specialists including Speech-Language Pathologists, Occupational Therapists, Reading Specialists, and Math Specialists. When needed, Gaynor specialists join children in class or work with them one-on-one or in a small-group setting. Our team-based approach allows specialists and expert faculty to collaborate, ensuring each child achieves individual goals. Gaynor’s Orton-Gillingham Instructional Program has been officially accredited by the Academy of Orton-Gillingham Practitioners and Educators. As such, we are an Organizational Member of the Academy and a member of the Academy’s Council of Accredited Programs, one of only two schools in the New York metropolitan area to be so certified.